Whirlpool is a giant multinational company and started doing business in India in late 1980 with a joint venture with TVS group. In 1995 Whirlpool bought the company Kelvinator India Limited. In 1996 Whirlpool of India Limited was established with head office in Gurugram, near Delhi and merged all their Indian assets into this one Company. Whirlpool now has manufacturing facilities in Faridabad, Pondicherry, Pune and is now a leading company in India producing washing machines, refrigerator, microwave ovens and air conditioners. The Whirlpool Destroyer World 61005 6-Litre Water Purifier is the latest in the Whirlpool range of water purifiers. This is a very unque water purifier. It does not require electriciy to work, but even then, it performs as good as an RO water purifier. It removes dangerous heavy metal contamination from water and also gets rid of all bacteria, virus and cysts from water. It is also cheap at less than half the price of some of the cheaper models of RO water purifiers. It should be noted that the Whirlpool Destroyer water purifier should only be used with water under 500 ppm TDS. What TDS means is explained in our page on water impurities.. Municipal or Corporation supplied tap water in the major cities of India are normally under 500ppm TDS. So for city tap water the Whirpool Destroyer water purifier is ideal. This purifier is not ideal to use with brewell or well water. For that we recommend an RO water purifier. 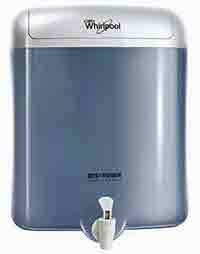 The Whirlpool Destroyer Water Purifier is a wall mounted water purifier with 6 litres purified water tank. The special EAT filter element in the Whirlpool Destroyer Water Purifier can purify upto 2200 litres of water, after which it should be replaced. For a normal house with 2 adults and 2 children, the average drinking water usage for both cooking and drinking is about 15 to 20 litres. This means that each Whirlpool Destroyer Water Purifier EAT replaceable filter cartridge element should last for about 4 months. Any way there is an automatic cutoff in the Whirlpool Destroyer water purifier when it reaches maximum capacity.